October 2009 was a time for Sidekick owners that likely still haunts their dreams and makes them shudder at the thought. Well, maybe not that serious, but the data outage that occurred during that time caused Sidekick owners quite a lot of grief and downtime, not to mention lost data. 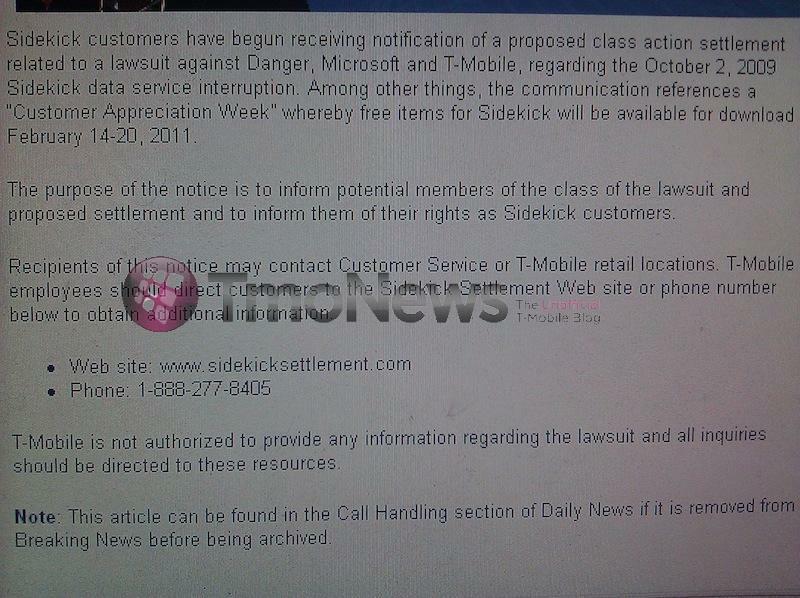 Finally, a settlement has been reached between Danger, Microsoft and T-Mobile regarding the “data service interruption”. Those who were part of the class action lawsuit will begin receiving notices of the settlement along with the proposed settlement details. They will be directed to www.sidekicksettlement.com, but as of this writing, that is not a live site. Bear in mind T-Mobile won’t be allowed to provide any info regarding this so you’ll have to use the above resources when the time allows to understand your rights as a member of the lawsuit. Thanks to one of the commenters below, it looks as though you can also select from a $35 gift card or a check for $17.50. If you want the full read, thanks to the folks at TechFlash (who also provided the above details regarding the 12 items) they’ve got the full PDF settlement live on their site. What I don’t see here and I have not read the whole settlement is what occurs if the individual who is named as a member of the class action is no longer a Sidekick owner and what provisions are set up in those instances. If any of you want to do the whole read and find anything out, make sure to drop a line in the comments and I’ll update accordingly. ← T-Mobile To Focus On HSPA+ Till 2013, Then LTE? You can get a 35 dollar gift card or a 17.50 check is the other option. Mine was never the same after that kept losing info, or when you delete things it came back, reboot all that good stuff and more. Rid it for the Nokia E 73 cos it was cheap at the time and just recently had to pay full price for the G2. The Nokia went bonkers went to the store as I was told by CS to change the sim the only thing is it locked me out. Between CS and Nokia CS no one had an answer how to unlock it after 2 hours or so I wounded up buying the G2. Bad part is the Nokia unlocked the next day for me. So within less than a year I have went through 3 phones and Iwas trying to hold out for the SK 4G so much for that. Your not Mike Chapman my State Farm agent are you? like a good neighbor, oh that was just too easy. Haaa! Man I would DIE for a free background and ringtone!! Yepper Peppers Peppity yep yep I have. Uber Excited for it too (though the design is kinda bland). well, better star planning your funeral because I’m not going to stop showing my support for Meego just like I don’t ask any of you to stop showing your support for Android. when you have “uber” important “business” contacts you don’t keep them on your sidekick.. IJS… how many important business meeting did you enter and whip out your sidekick and swivel open ur screen.. LOL… good luck with your business. $35 for T-Mobile they mean? what is the burden of proof on this? I recieved one of the settlement notices today, and basically, if you get the notice stating you can download apps from the Catalog you don’t have the option for the check or gift card. So basically, if you dropped the Sidekick for another phone because of the outage, you’re most likely screwed for compensation. Whichever side thought was fair compensation screwed up. Because so many of you did not file for the settlement, the portion of the settlement each person received was much more than what was expected. Instead of $17.50, I got a check for $118+ … TMobile’s silly APP download appreciation day was bogus. They sent a letter that they were CANCELING the sidekick service right after customer appreciation week. Some appreciation! I switched to Virgin/Blackberry and am on my way to the bank!! !